Parents, we’re here to help you and your children. Our mission is helping kids to learn so they can be competent and accomplished. Our mission is helping parents and teachers help their kids. helping students realize, optimize and strengthen their true, native ability to learn and be able to make themselves impervious to the abuses of poor educators, educational systems and procedures. We have no secret or exclusive, “members only” areas on our site. Some things you will need to buy though; but that is understandable: Amazon and Barnes & Noble wouldn’t like us if we gave our book away for free while they sell it. Read the success stories of what we did for some kids and parents. They are wonderful, wonderful stories of success that, sometimes, I have a tear in my eye when I read. They are stories that, as the Japanese would say, “bring a cry for happy”. You too will be moved by these successes. And you will have the opportunity to imagine how it will be for you and your child, and indeed all of your family, when you embrace and use the materials we have available for you on this site. We consider you our friends. Why? Because of your care for your children, the children who are our future also, and the children who are so important to us all in this society. We want to help you fulfill that duty. To inform and make available needed information on the subject of study and learning so all students can win and parents and teachers can enjoy seeing them win. This site is devoted to giving all parents and teachers what they want…their kids learning and getting good grades, being able to comprehend what is going on around them, and accomplishing the good things in life. Kids want this for themselves as well. Hence we have no secret or exclusive, “members only” areas on our site. All is available to you. 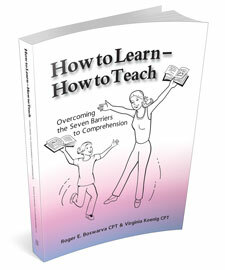 Imagine the joy of seeing your child learning easily, discovering his or her full possibilities, and accomplishing all of his or her dreams and aspirations because of your efforts…compare that to the anguish many parents experience as they see their children stumble and fail in their effort to learn. It’s heartbreaking. Particularly so for those parents who don’t have any answers with which to handle what is happening to their children in school. The ability to learn is an ability we all have. Young children learn naturally. Yet, too frequently we see academic failure as an outcome of our schooling system. We investigated what’s going on, and found that there are Seven Barriers to Comprehension which are routinely being violated and inflicted on our children during their learning process. © 2019 Ability Consultants, Inc. All rights reserved.